I know precisely when my audio obsession started. It was fifteen years ago that I first ate the musical mushroom and, Timothy Leary-like, blew open my doors of perception. It was in a long, dark, low-ceilinged basement that I had my revelation. My brother dropped the needle on his J. Michell turntable. Amplification was Pass Labs Aleph mono blocks. Speakers were Audio Physik. And power conditioning was by Audience. I felt a rush of blood to my head. It was sheer aural ambrosia. Wes Montgomery’s sweet guitar seemed to float in space before me. I was transported. Think Ewan McGregor or John Travolta, but a safe and legal way to get that high. At that moment, I knew that I had not really been listening to music, but rather a pale imitation of it. For fifteen years, I have been on a quest to recreate or surpass that magical moment. To taste again the honey dew. To drink the milk of paradise! In pursuit of another passion, in search of oral ambrosia, on the island of Madeira. During the last six months, I have helped to get the Canadian audio and music review site www.wallofsound.ca started by reviewing fifteen or so products. I maintain a wine and spirits blog that I started in 2007. Wine critics and sommeliers can take a short intensive ‘Master of Wine’ course in the UK and receive a universally acknowledged certificate, an imprimatur establishing them as ‘experts.’ Audio critics have no such thing to hang on their walls. And perhaps that’s for the better because great sound, like great wine, is a highly personal and subjective matter. You might prefer Solaia to my Ornellaia. Both are great wines but highly different even as they are close neighbours. Is one better than the other? It’s impossible to say. You might like push-pull ultra-linear; I might prefer single-ended pentode or triode. Or maybe Class-A solid state is my thing. I don’t espouse aural relativism. Rather, I believe there is bad sound as well as good sound that comes in many colours. I like virtually all forms of amplification, sources and speakers. I have deliberately tried to collect equipment that spans the spectrum of design philosophies. My Maggies can wrestle with my muscle amps; my Tektons can shake the floor with my flea-watt SEP amps. My Harbeths can dance with anything. I have high, low and medium sensitivity speakers. I have low and high power amps. I own gear made in a dozen countries, from Canada to China. Like some of you reading this, I am a polytheist who worships just about every audio god there is. In my current stable of goodies, I have a giant 845 SET amp putting out 22 watts but also diminutive Class D monos pumping out 1'100W into 4 ohms. Half a dozen single-ended pentode amps and a DIY headphone amp grace my house. I own a tube preamp, a solid-state preamp, a vinyl rig, five DACS (three of them tubed), three CD players and one SACD player. These various components feed two pairs of budget bookshelf speakers, one pair of highly inefficient planar speakers, some highly efficient floorstanders, a pair of single driver crossover-less DIY speakers and my treasured Harbeths, my first love. Mullard 12au7 and Tung-Sol 5998. Believe the hype. | In 28 years of collecting LPs and CDs, I have amassed this: Classical to the left, jazz to the right. And on top, tubes, glorious tubes. At the end of the day, just like you, I have my listening experience as a guide. If, as some say, 10'000 hours are required to master a musical instrument or a sport, most music lovers and gear heads will have accumulated the listening miles by the time they are 30 years old. I may have had a head start because my mother, a pianist, exposed me to her playing and listening habits from the womb. From my mother’s warm piano to the old tubed console record player, there was never a quiet moment. From Wagner to Dionne Warwick, from Elgar to Elvis, I heard it all. My older brother became an audiophile in his teen years. With his Pioneer, Kenwood and Luxman gear, he drilled Al Di Meola and Spyro Gyra indelibly into my brain. As well as Black Sabbath and Alice Cooper. In my youth, I quit my piano lessons and bought a guitar to punish my ma. As a result, today I am incompetent on the piano. In my twenties, I tried my hand at clarinet because I found it the most seductive of woodwinds but it was a continual struggle to get the embouchure right so I gave it up. Today, I take solace in the open-back five string banjo which I play clawhammer style. I am fortunate to be friends with Canada’s finest most versatile Old Time musician. He lives nearby and is also my banjo teacher. I derive immense pleasure from simply nailing a chord. I lack the manual dexterity and the discipline required to become a real musician. But where sound is concerned, like Paul Simon in another context, I know what I know. At least I think so. Of this I’m sure: my audiophilia didn’t bloom until my early twenties. As I emerged from the dark ages of adolescence, my musical tastes underwent a renaissance of sorts. I began to appreciate the timeless beauty of great French composers (Debussy, Ravel, Fauré), much to the delight of my mother who had often filled the house with their hypnotic piano music. I imbibed as much Baroque and early music as one could stomach. I think I was the very first on my floor in college residence to own a CD player, a Sony CDP something-or-other. During my twenties, I medicated my mind with liberal doses of classical music. Other than the classical canon, ‘classic rock’ was my staple fare: Beatles, Stones, Zeppelin, Floyd and the Who. In my late twenties I caught the jazz bug and haven’t looked back. That's what I listen to most of the time. As I write this, Gary Peacock and Bill Frisell are playing. In my thirties, with the flowering of the Naxos label, once again I got all medieval on my sound system. But jazz never left the scene. During my late thirties, I fell for Old Time, Bluegrass, blues and rap. 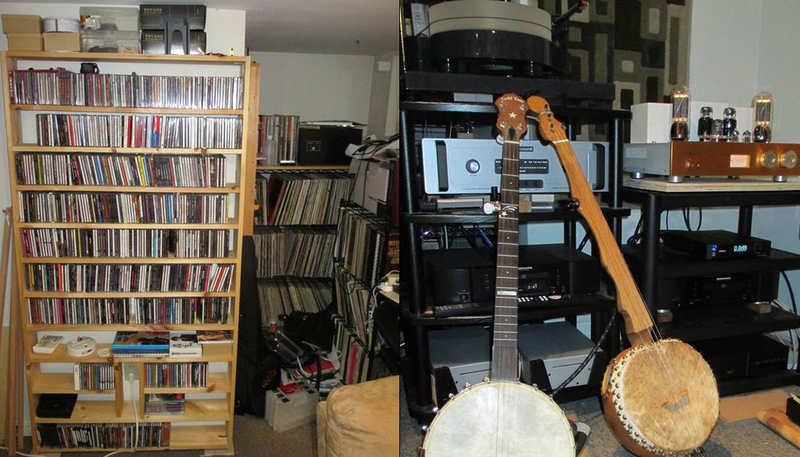 I started collecting music featuring the gourd banjo, open-back clawhammer banjo and dobro. At the same time I discovered the oud. East Indian electronica, reggae and Japanese flute music were next. Listening is easy to do. Listening well is more difficult. It took me plenty of time and a whole lot of spending money. My idea of an ‘affordable’ amp might be $1'000 but to most people that is a crazy number. Regrettably, as bling audio soars into six-figure land, the general audiophile’s frame of reference gets coloured—for the worse—as it moves upward. Today’s idea of a good bargain might seem outlandish by the standards of the 1980s. But I don’t believe that the good ol’ days are behind us. The headlines say these are the worst of times. I do believe it’s true in some ways. MP3 is a crime against the ear. My hometown of roughly 150'000 people has not one single conventional brick and mortar retail hifi store. There is one fine operation but it is based in the owner’s suburban home and he does most of his business online. Downtown, there is not one single place to buy new CDs or LPs. Something’s lost when something’s gained and the price of computer-based audio is the death of the Main Street CD store. Having said this, there are more people around the globe listening to good music on good sound systems than at any other time in history. The 6moons readership is some sort of virtual band of brothers, one quarter million men strong, marching together down the road to audio nirvana. 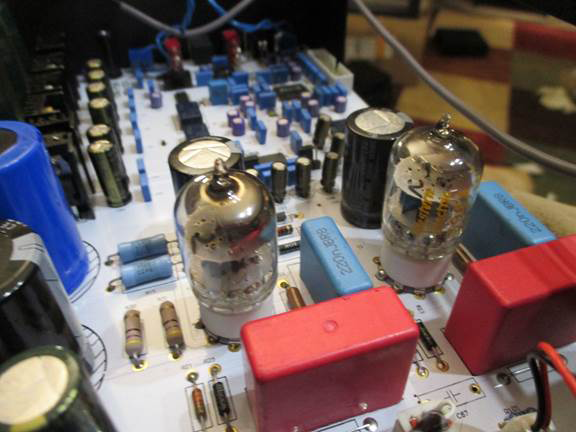 Having owned many a vintage amp and speaker and having seen most of them break and/or produce tinny sound, I shed no tears for dried-up capacitors and dried-up sound - the good ol’ days that never were. Today, to paraphrase Harold Macmillan, we’ve never had it so good. I have seen over 200 pieces of audio gear come and go from my house over the last fifteen years. My audio merry-go-round started with very basic Yamaha and PSB—the gateway audio drugs--then moved up to Marantz, B&W, Tannoy, Mission, Linn, Epos, Maverick Audio, Cambridge Audio, Mordaunt Short, Trends Audio, Burson, MHDT Labs, Audiolab, Little Dot, Primaluna, Almarro, First Watt, Klipsch, Pioneer (by Andrew Jones), Beyerdynamic, Grado, Audio-Technica, Decware, Odyssey Audio, HiFiMan, Naim, Harbeth, Tekton Design, Wyred4Sound, Line Magnetic, Pro-Ject, Graham Slee, Dynavector, Resonessence Labs, Shunyata, KImber, DH-Labs, Connex…culminating with Crack, a DIY headphone amp from Bottlehead. And then there is my stash of NOS tube treasures. Some Holy Grail stuff like Tung Sol 5998, RCA 5691 and 5693 red base, RCA 6L6GB, Mullard 12AU7, RFT Siemens EL34, Philips Miniwatt 12AX7, Western Electric 396a, GE Five Star 5670s. That’s how it goes and everybody who knows me knows it won’t ever stop. One day I might own a Devialet but it won’t replace my other gear! Rock CDs and about 1/3 of my vinyl collection. VPI record cleaner in top right. Like many of you, I’m hooked and I don’t want it to stop. In my defense, there are no bling items listed above. I strive to find affordable gear that punches well above its weight. Currently I am perfectly happy with a $480 DAC and in fact I prefer it to a $1'000 DAC I also own and a $2'000 CD player I used to own. At right are its guts in all their glory, tricked out with the ultimate 5670-type tube, the Western Electric 396a. I think my inexpensive DAC plays Redbook CD better than a $6'000 CD/SACD player I once listened to for a full weekend on a trial basis. I’m glad I didn’t buy that. My most expensive single component is my Line Magnetic 518IA amp. I think it competes with gear costing four times as much. My day job involves a whole lot of writing. It is a solitary affair and I try to liven up the atmosphere with music. I usually opt for piano sonatas, solo guitar or jazz trio played at low levels because this sort of music does not interfere with the work at hand. I am dogmatic about one thing: my ‘work music’ must be played through a tube amp. I am not aware of a sub $400 small-footprinted solid-state amp that can produce the tone and warmth I crave. I have owned Tripath chip amps and they are wonderful little devices producing prodigious bass. But they just don’t float my boat, being too clinical for my ears in a near-field setting. I usually have at least 6 or 7 tube amps kicking about at any given time. The 6L6/5881 and 845 are my favorite power tubes, with EL34 and 2A3 vying for third place. For low-level office listening, I usually use 6L6s in SEP mode. But I am not dogmatically committed to tubes per se. When I am home alone, I love turning it to 11 with my Wyred4Sound Class D mono amps. Regrets? I have just two: parting with a First Watt M2 and a Decware CSP2+. That Decware was one mean preamp. Today I use an Audio Research LS17 as my main preamp because it shoots straight down the middle and is dead neutral. I can use it in single-ended or true balanced mode, feeding it with the amazing little Audiolab M-DAC. When I pair the LS17 with a power amp, it imparts very little sonic signature, allowing me to evaluate the power amp on its own terms. The LS17 has solid-state speed with tube holography. I am more a ‘musicality’ person and tone freak than a fan of hyper detail. I spin LPs but I love a tube-based DAC by Musical Paradise that gets me pretty close to vinyl. The first great speaker I owned was the Harbeth Compact 7. I will probably never sell it. I also love planars. I will never part with my Magnepan 1.7s except perhaps to trade up the line if I ever have the space for the 3.7s. Speaking of space, I live in a small house and don’t have much. My youngest son—we’ll call him Bam Bam--has forced me to move my main rig to the man cave. I could just see him taking impish delight in ripping the tonearm off my Pro-Ject RPM 10.1. I wonder if my Maggies and Tektons, rear left, act as a sort of room treatment. Of what sort, I’m not sure. | The best sub $1000 2A3/300b amp ever built? Musical Paradise MP 428 mk2 with NOS RCA and TJ Full Music 2A3 mesh plate. Aesthetically the room is a disaster. Sonically my man cave is a blessing in disguise. It measures roughly 8.5 meters or 28 feet long, with a nook at each end, and just 3.3 meters or ten feet wide. The ceiling is about 2.1 meters or 7 feet. It is carpeted and well damped, with no nasty nodes. Sitting on concrete slab that rests on the Canadian Shield, I get thunderous bass and micro-detail galore from my Dynavector 10x5. Bass galore, but fortunately there’s no boom in my room. I place my speakers about 6 feet from the rear wall on the right side, and perhaps 10 feet on the left side where there is a nook. I usually listen from a distance of ten to twelve feet. This room houses my CD collection of about 4'000 discs as well as my 2'000 LPs and 200 SACDs. I have only about 400 CDs burned to disc in AIFF format. I haven’t made the time to do more. I went through an intense headfi phase but I worry about long-term damage to my ears so I try to keep my listening to a minimum. I have Beyer DT770s, DT880s and HiFiMan HE-400s. I have owned some far better cans like the T1s. The name-dropping of equipment throughout this biographical profile may speak to the borderline OCD nature of this hobby. Or perhaps I do project! In any case, it should give you an idea of where I have come from and what I am familiar with. I am thrilled and humbled to join 6moons. I hope to share accounts of some mind-bending but affordable equipment with you.